Heart Breaker, 2004, single channel video, 16 mins. and 24 secs. Opening on February 14, Steve Turner Contemporary will present Heart Breaker, a video by Kate Gilmore. 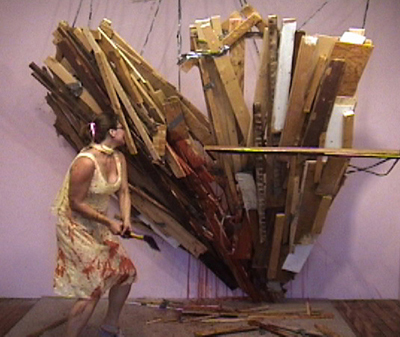 A valentine to early 70s endurance, risk-taking video and performance, Gilmore, “dressed to kill”, violently deconstructs a heart-shaped sculpture, taking a little piece of our nerves bit by bit. Kate Gilmore lives and works in New York. She got her MFA (2002) at the School of Visual Arts, New York and BA (1997) at Bates College, Lewiston, Maine. She currently has a solo exhibition at Franco Soffiantino Arte Contemporanea, Turin, Italy, and last year, at the Institute of Contemporary Art, Philadelphia, University of North Texas Art Gallery, Denton, Texas, Artpace San Antonio, San Antonio, Texas, Maisterravalbuena Galeria, Madrid, Spain, and CESAC Centro Sperimentale Per Le Arti Contemporanee, Caraglio, Italy. She is represented by Smith-Stewart Gallery in New York.